For many of us music, records, VINYL in fact are elemental to our existence. A week without a gig, a trip to a record shop or a few hours spent crate digging or clicking (“crate clicking”, I like that one…) is a wasted week. Ancient Greek brainbox Empedocles thought he had it all figured out when he proposed earth, air, water and fire. Not a bad start and you never heard any complaints from Maurice White and his merry band of funketeers. But science being all science-y decided there were more and before you knew it there’s 118 of the beggars with crazy names like Dubnium, Europium and GOLD! So we thought why not celebrate all things elemental through the medium of our much-loved vinyl (or polyvinyl chloride as we never call it and which isn’t even an element, pah!). It’s a free play night so there’s no central albums – just bring it and play it. As long as you can tie it back to the theme of ELEMENTS. On nights like this we easily get through 50+ diverse tracks with lots of polite and friendly chopping and changing at the pre-loved wheels of steel. And if you’re unsure how to work the decks then there is always a friendly face willing to help. Lots of fun, guaranteed. As usual, our lovely hosts The Triangle will be running the cash & card bar downstairs with some amazing beverage choices, many of them you won’t otherwise find for hundreds of miles. And you can help yourself to some of Bradford’s finest Indian snacks courtesy of Record Club regulars. So, we’ll see you upstairs at The Triangle, 47 Bradford Rd, Shipley from 8pm until 11.30pm. Elementary! On Saturday 9th March we are very proud to bring you our first Saltaire Record & Retro Fair! Formerly under the care of the fine folk at Rose & Brown, the Record Club are now the custodians of the district’s finest record fair. Up to 20 stall holders, loads of records and pop & film memorabilia and ephemera to peruse and buy, all with a warm Yorkshire welcome. You can find us at the Caroline Club on Caroline St., Saltaire. Doors open at 10am and it’s 50p entry. If you’ve been before then you know what to expect. If you haven’t then don’t miss out! We’re easy to find. Saltaire is on a main train route out of Leeds, Bradford and Skipton and there are loads of buses to and from Bradford serving the top of village, with just a very short walk into the heart of Saltaire. There is limited parking outside the venue and in the Council car park on Caroline St. but as it gets busy n the village it’s wise to use public transport where possible. And once you’ve finished at the fair you’ll find Saltaire is a great place to saunter around, with a selection of shops, cafes, bars, Robert’s Park and of course the incredible Salts Mill. 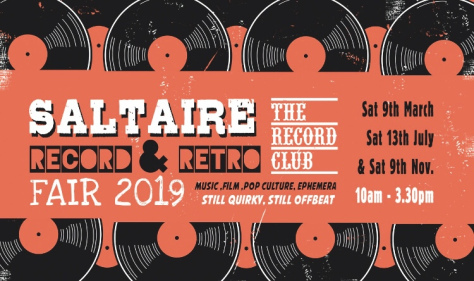 Interested in having a stall at a future Record & Retro Fair? Details are on our sister site. We are holding three fairs in 2019, the next two are on Saturdays 13th July and 9th November. Stalls book up quickly so don’t delay if you are interested.